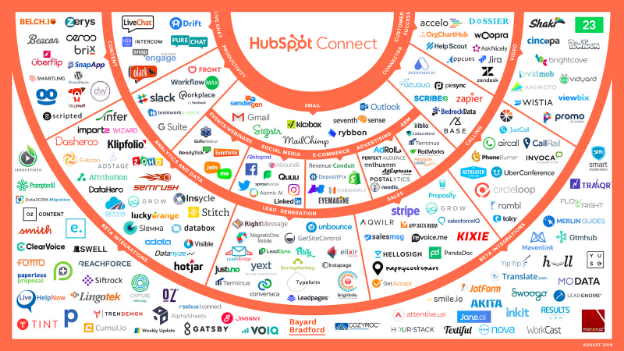 HubSpot announced today that the HubSpot Connect platform partner program has grown to now include more than 200 integrations. In the last year, HubSpot Connect has seen 108% growth in the number of total Connect partners. Today, there are over 6,000 software vendors building tools for marketing, sales, and service teams. At the same time, the growth rate of SaaS spending per company is projected to increase by 118% from 2017 to 2020, according to Blissfully. Businesses continue to look for the right mix of applications for their industry, size, and needs among the thousands of capabilities, use cases, and choices for companies building their technology stack. As a platform company, HubSpot embraces the power of these tools to complement or extend the functionality of HubSpot’s core product offerings. Through the Connect Program, the company helps customers find and use high-quality, good-fit solutions that are right for their business by certifying and curating applications within the HubSpot ecosystem. The average small to mid-sized business pays for more than 20 SaaS apps, an investment that becomes more impactful when those tools work together. In the last year, HubSpot has built 84 new public API endpoints and four new APIs, allowing developers to build on top of the HubSpot platform and connect HubSpot to the full spectrum of software being used by growing businesses. HubSpot also helps customers find the best-fit integrations for their needs by curating lists of apps into use case categories (with new additions like calling and ABM) and audience collections (Apps for Startups, Apps for Agency Services, and Free Apps). In order to encourage and enable these integrations, HubSpot continues to expand and improve the benefits for the HubSpot Connect program to increase the value for partners. In 2018, the Connect program launched Apps for Startups and Apps for Agency services to help partners reach their target audiences and provide special offers to startups and agencies in order to increase adoption. HubSpot also hosted more than 100 partners at the first annual Connect Partner Day in the spring of 2018 and invited all Connect partners to Partner Day at INBOUND 2018. These events provide partners the opportunity to learn more about building on the HubSpot platform, to network with each other and members of the HubSpot product and marketing teams, and to discover new ways they can grow better as a HubSpot partner. Learn more about the HubSpot Connect directory or apply to join the Connect Program. SEATTLE--(BUSINESS WIRE)--Amazon Web Services, Inc. (AWS), an Amazon.com company (NASDAQ:AMZN), today announced that HubSpot has selected AWS as its preferred public cloud provider. HubSpot’s core products, including HubSpot CRM, Marketing Hub, Sales Hub, and Service Hub, run on AWS, and HubSpot will expand its use of AWS to build new applications in the cloud. AWS enables HubSpot to scale its business quickly, powering its global expansion and companywide innovation. In turn, HubSpot is able to focus more of its resources on developing new cloud-based products and services on AWS for its over 48,000 customers in more than 100 countries. AWS’s expansive infrastructure, operational expertise, scalability, and industry-leading services gives HubSpot the right set of tools to strengthen its software, services, and support capabilities. HubSpot built a highly automated microservices architecture on AWS to support applications of all sizes, scale, and complexity, gain greater agility, and establish a DevOps practice in the cloud. They’ve also constructed a data lake using Amazon Simple Storage Service (Amazon S3) and Amazon Athena to ingest and analyze operational data so that HubSpot can diminish internal waste and cut operational costs. In addition, through utilizing Amazon machine learning technology such as Amazon Lex, HubSpot added natural language processing capabilities to GrowthBot, its chatbot that helps marketing and salespeople quickly and easily get help creating content, researching competitors, and monitoring analytics. HubSpot is a leading growth platform. Since 2006, HubSpot has been on a mission to make the world more inbound. Today, over 48,000 total customers in more than 100 countries use HubSpot’s award-winning software, services, and support to transform the way they attract, engage, and delight customers. Comprised of Marketing Hub, Sales Hub, the soon to be released Service Hub, and a powerful free CRM, HubSpot gives companies the tools they need to manage the customer experience from awareness to advocacy.